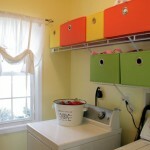 Real-Life Laundry Rooms That Work | Your home, only better. 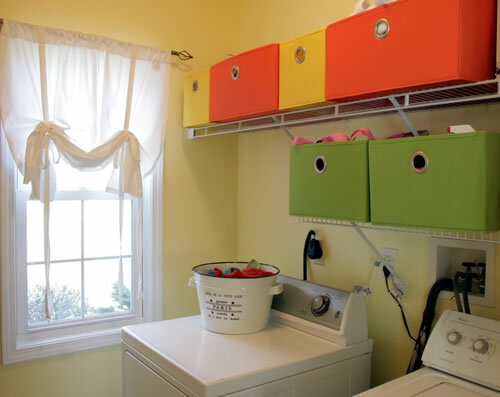 I’ve drooled over laundry rooms on Pinterest that are grand enough to use as a proper guest room. I can almost hear the songbirds chirping outside the sunlit rooms while the cheerful woodland creatures help fold the laundry. If that’s your reality, thank you for sharing your aspiration with the rest of us! 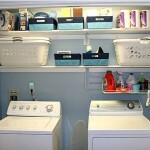 I would like to show you another, more realistic collection from my real-life laundry spaces from four different houses. 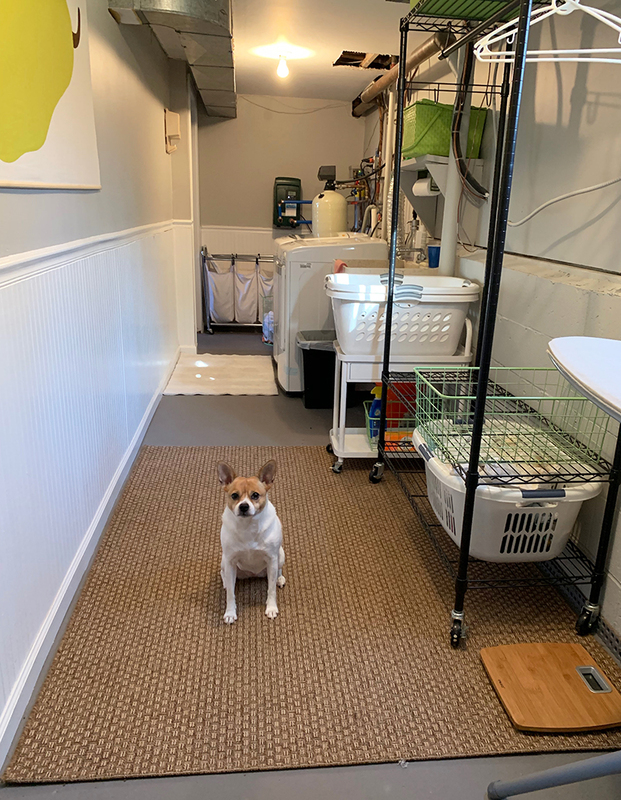 I have laundered in the basement, in an upstairs closet, and in a very small off-the-kitchen room. 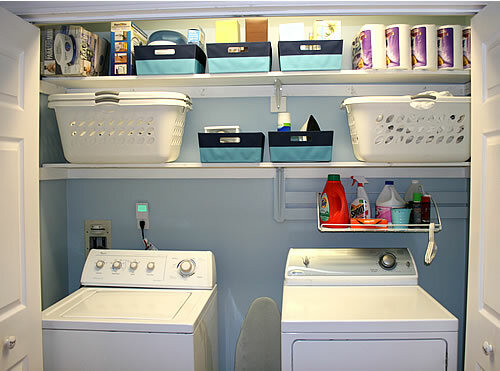 Although some laundry room configurations feel like an architectural after-thought, one thing that rings true for all of them – functionality must come first for these hard-working spaces! 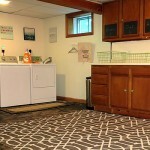 I’d like to start by sharing my most recent basement laundry renovation in my as-is project house. It’s not fancy. But you should have seen it before! It was gross, complete with signs of previous water damage. This space also serves as my “water treatment plant” as I live in an area without city water and sewage. 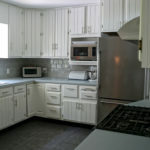 Therefore, the plan was mostly about cleaning, neutralizing and making it functional. 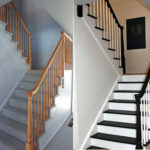 We painted the cement floor, added drywall/beadboard, and painted the room. 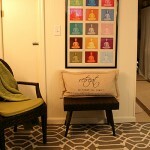 In fact, the only design elements I added was a tapestry wall hanging, an area rug and a few bins. 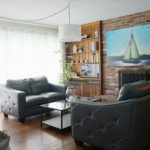 Every piece of “furniture” added into this room has a functional job to do. 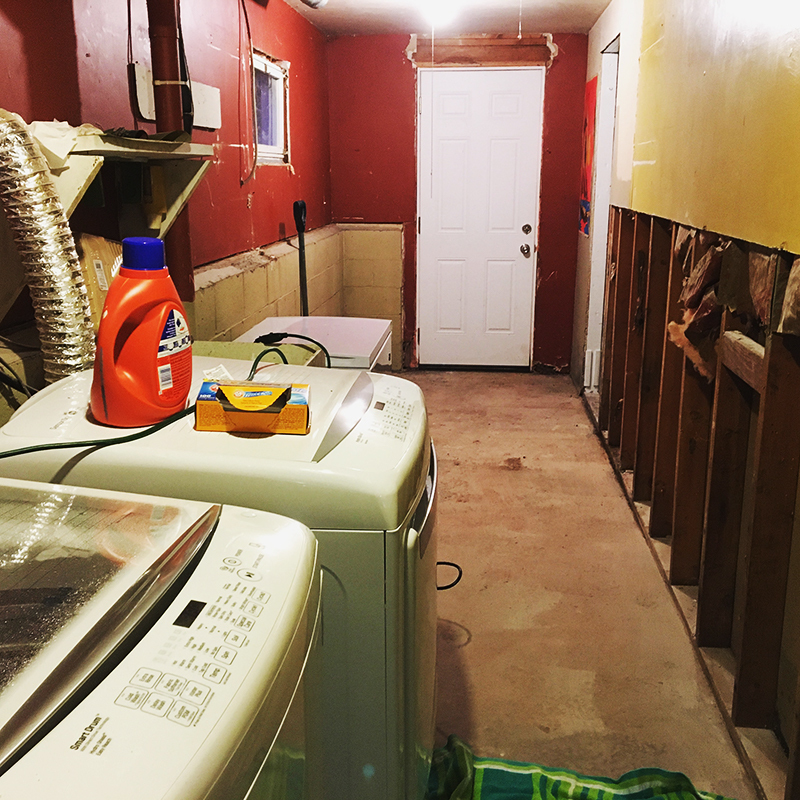 As part of the laundry room renovation, I also had to waterproof the basement and add a sump pump. 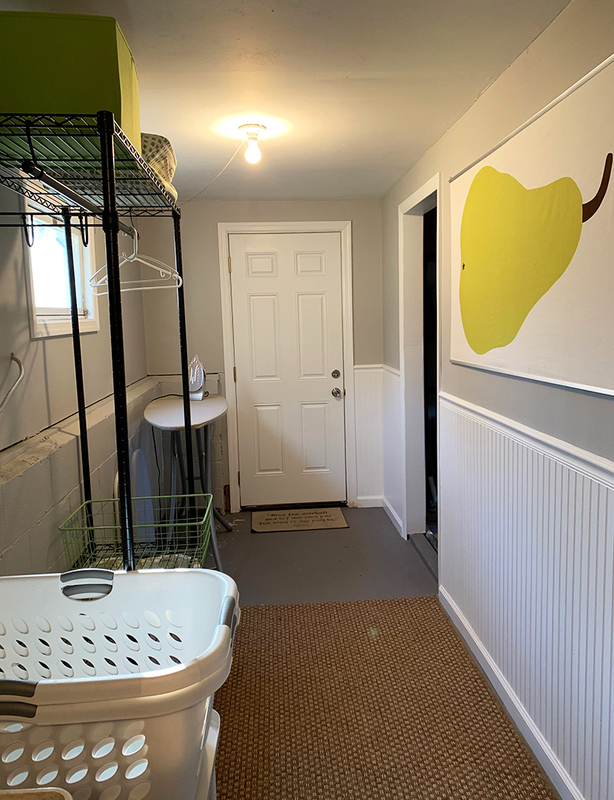 And just for fun, after finishing this space, I had to replace my water softener (leaking), and then the hot water heater which is on the other side of the wall from this room. 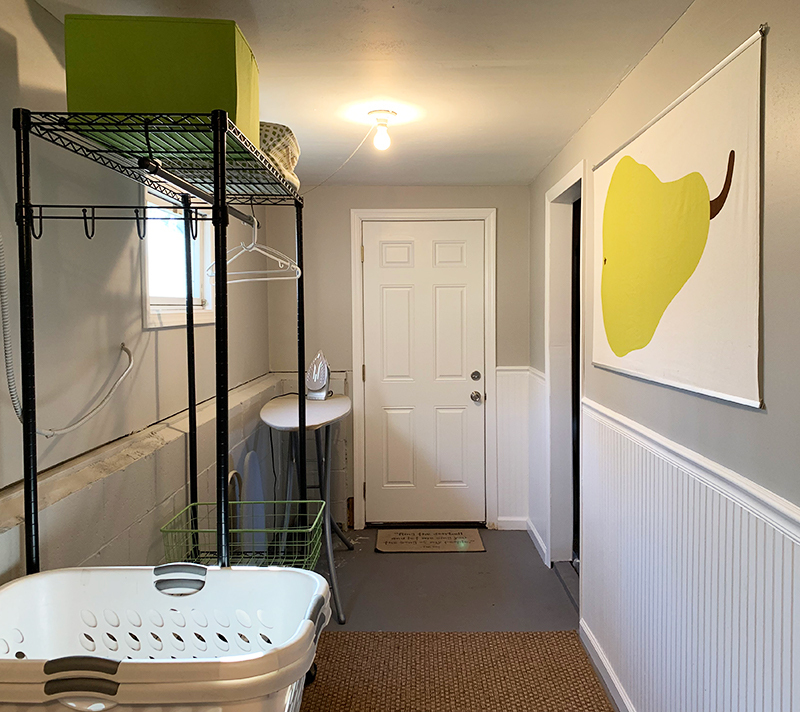 It’s an awkward long and narrow space that runs along the back of the basement. For context, I’ll share the northern and southern views first. Because of the awkward configuration of the room, I set up mini-laundry stations like an assembly line. 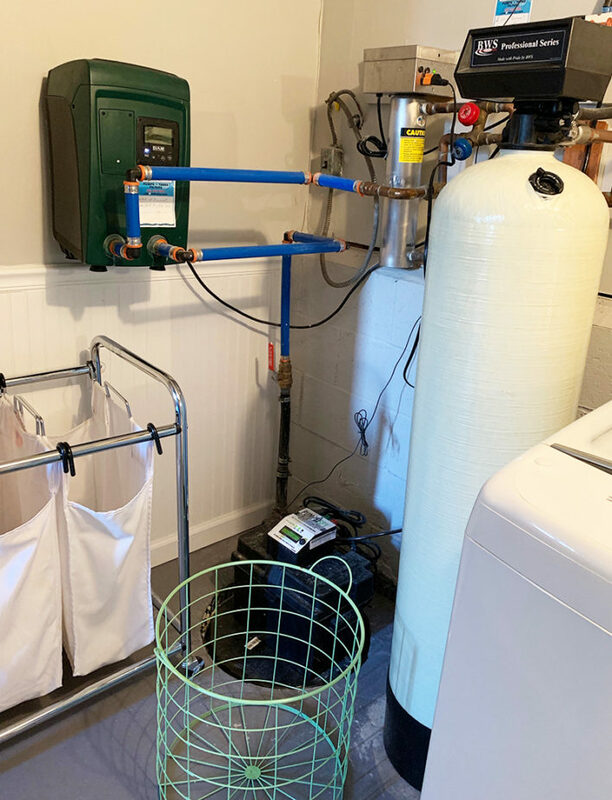 First, there is the sorting quadrant, which shares space with the lovely water treatment plant (well pump, water softener, water purifier and sump pump). Rather than view it as an eyesore, I thank the equipment components for their daily service. Without clean, running water, this would be camping. Therefore I did not even try to hide it. 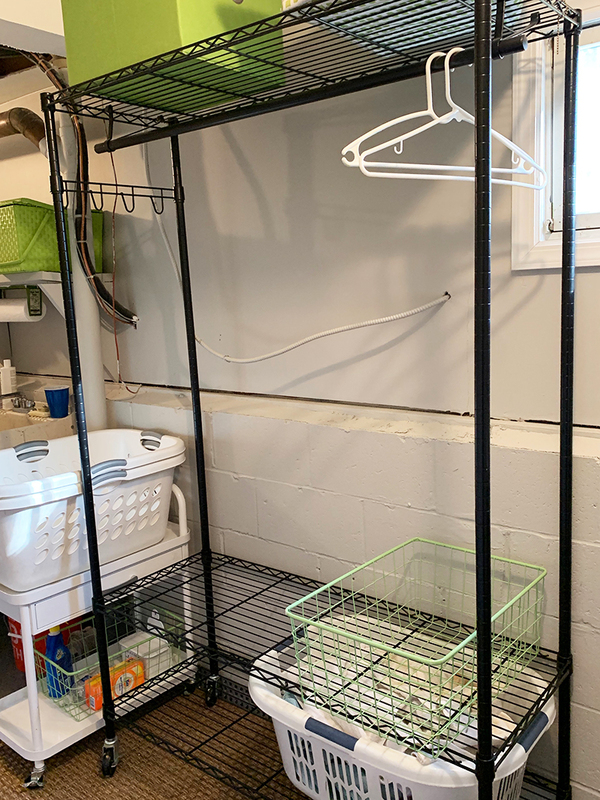 Next is the washing area. 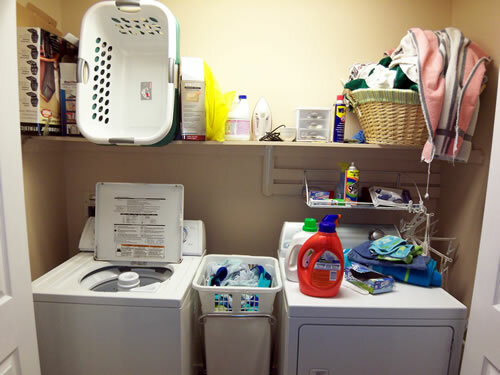 The key is to have everything within reach, from laundry detergent to a trash can for lint disposal. 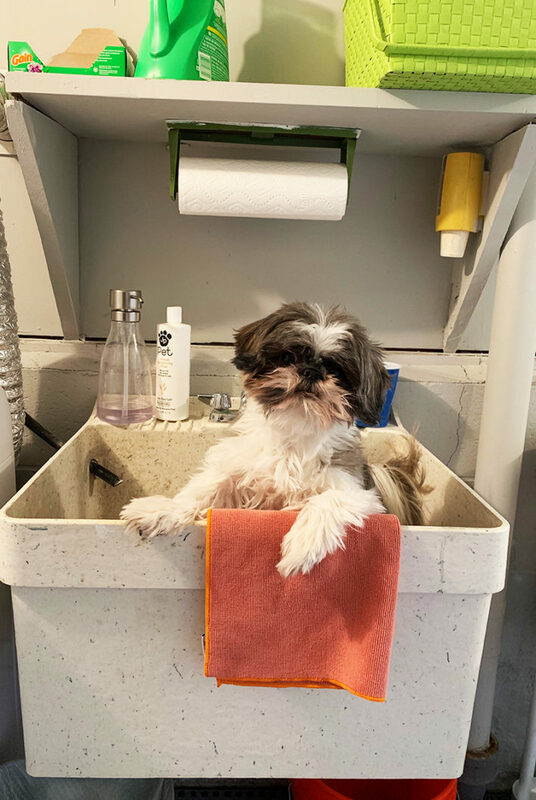 Bonus: the utility sink is perfect for washing the dogs. The next station is for folding and hanging. Having the laundry basket at the right ergonomic height is key for back health and overall attitude. 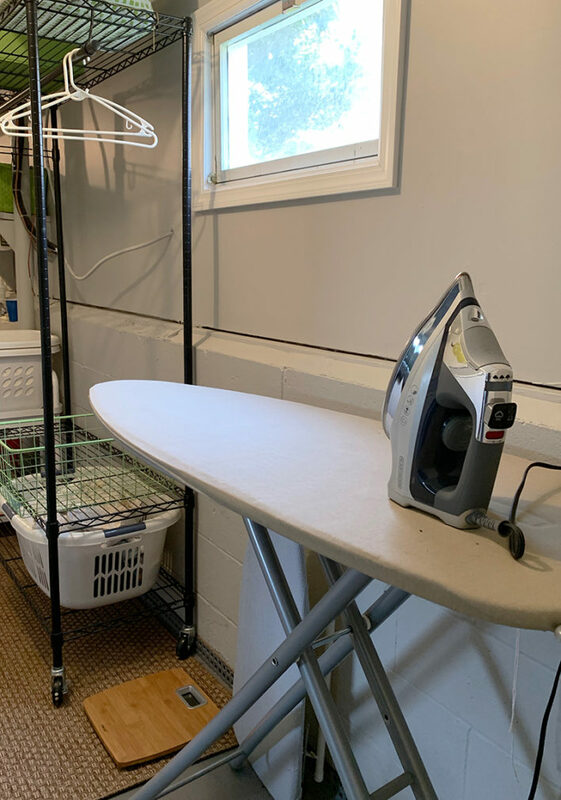 The last stop on this laundry assembly line is an (optional) ironing space. In theory, that is. I hate ironing. 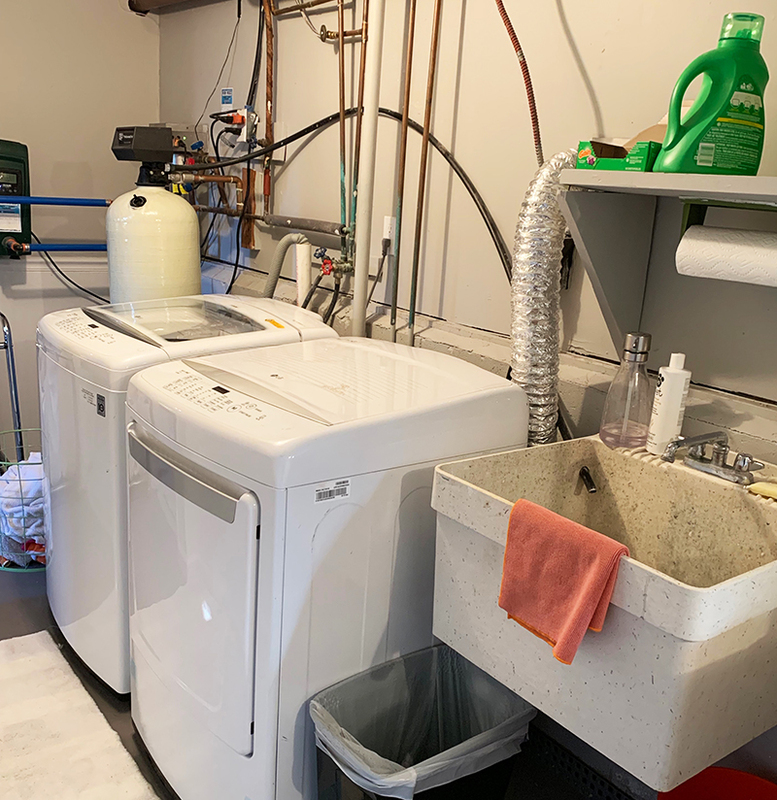 This ended up being a very expensive but functional laundry room and water treatment plant that will never look like those fancy laundry room on Pinterest. But after spending a lot time in this room, I find the efficiency and minimal design works and makes me happy! And running water and a dry basement? Priceless! 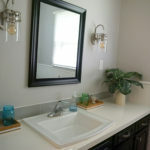 I should note my fabulous contractor did the whole project while I was on vacation! 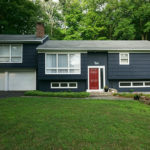 I felt like I was on one of those ambush makeover shows – really made coming back home exciting! 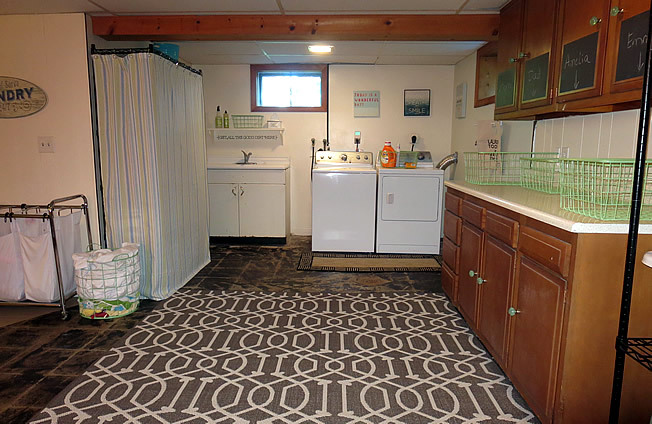 This home had a cavernous basement with an undefined space for laundry. 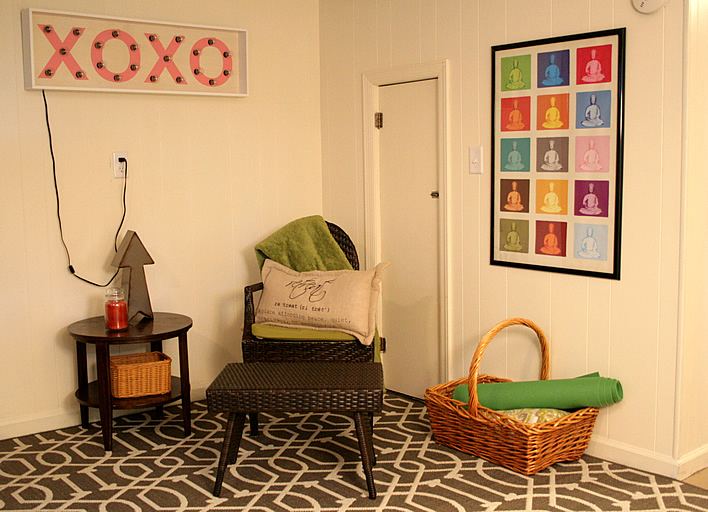 Bonus – it was big enough to add in a meditation corner! 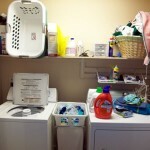 This laundry room was right off the kitchen and very small! It was a real effort to keep it uncluttered. This was not my favorite. This room/closet was tight, but well-located. A little paint and organization made it truly functional. This project made me so happy! Where do you do your laundry? And, do cheerful woodland creatures help out?